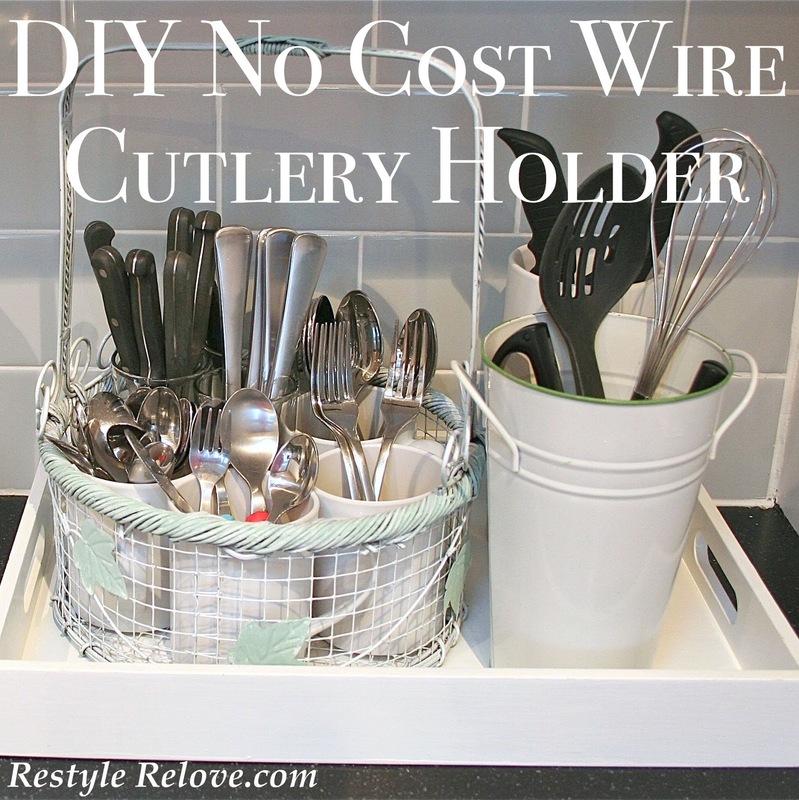 So, I decided to use what I already had and make a DIY No Cost Wire Cutlery Holder. I used a round self painted white & turquoise wire basket (thrifted at a yard sale for $1), some old white coffee mugs, and some highball glasses we don't use much. 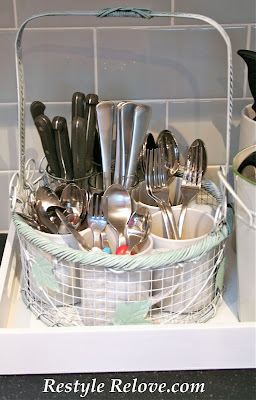 I fit them all neatly into the basket and then added our cutlery, and the kids as well :) The kids at the front and all the sharp pointy knives at the back in the glass jars, away from little fingers. I used an old white vase which was the perfect size to store our larger knives. 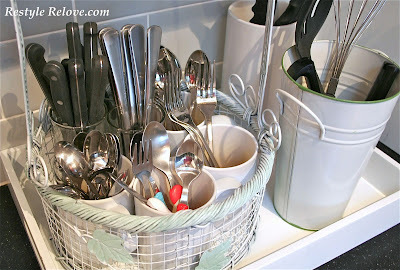 And our other utensils (most of which are in the dishwasher instead of the photo, hehe) are now in a white tin vase that I also got at a yard sale for $1. Then I placed them all in a white tray (also something I had thrifted for $2 and painted myself) on our kitchen counter. Now I've just got to stop automatically opening the cutlery drawer when I want something! Hehe. I think it's very cute... and very creative! I love repurposing things rather than buying new! I'm a new follower from the Linky Followers Party Hop! Great idea Julie! I'm stopping by from Homeroad. 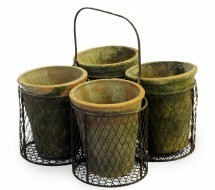 I see those baskets in the thrift store all the time, I will look at it with new eyes next time! I think I'd like mine spray painted with a zinc finish! Love it! What a unique idea! I couldn't see very well in the first photos, and I thought maybe you'd used a canning jar kit that goes inside the actual canner pot. Hmmmmm..... Something to think about! Yours is so cute though! I love how everything came together for you! So, you keep your out in this all the time?? 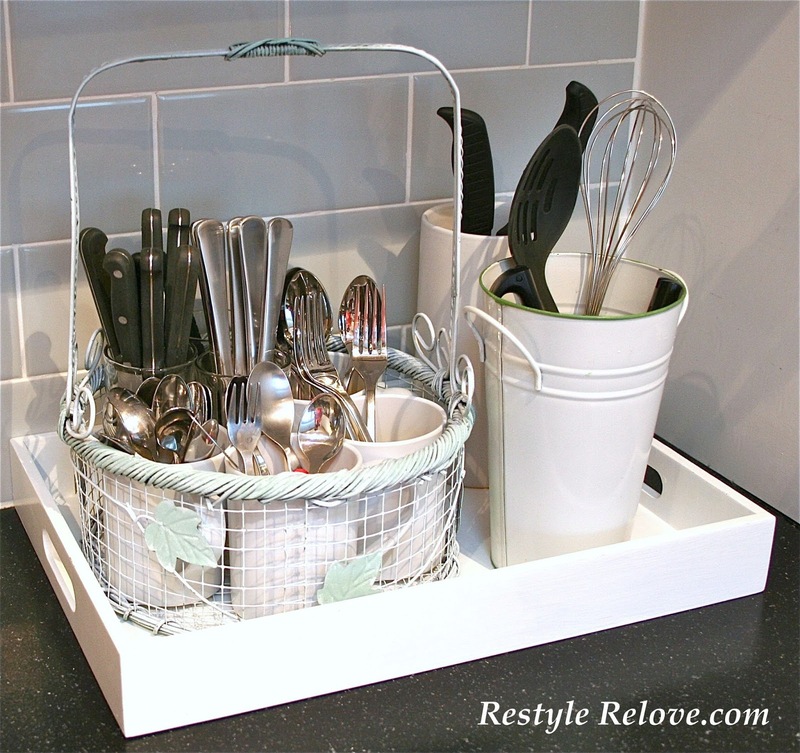 I have been wanting to do something like this because I don't have very many drawers in my kitchen. It has always seemed silly to me to use up a whole drawer on forks and spoons!! Can't wait to read more of your blog. I need to serious inspiration!! Came over from Not Just another Housewife. Found you via the Linky hop and have become your newest follower. I hope you have a chance to visit and perhaps become a follower of mine as well. Hi, thanks for following. i'm a current follower of yours too! very cute idea! This would work great in a craft area too for storage. Great idea and I love all of that white. Thanks for linking with cowgirl up and I hope you come back again next week. What a great idea! Thanks so much for sharing it with us this week! Hi Julie! 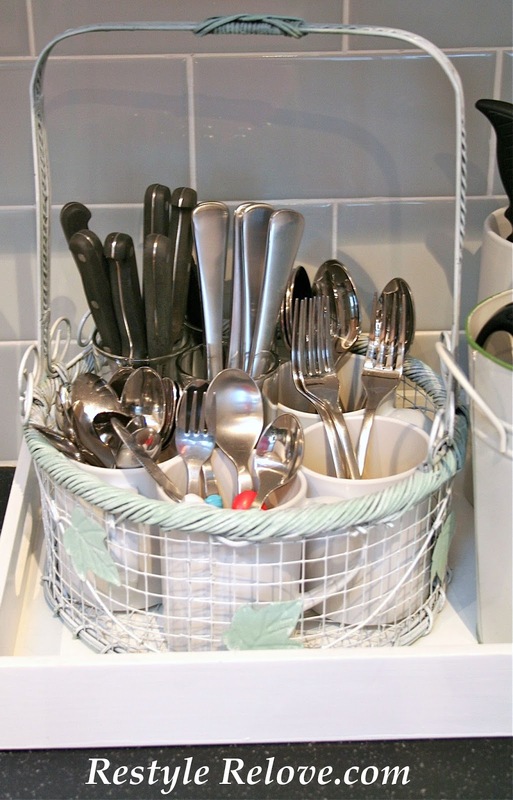 Thank you so much for sharing your cutlery holder! I LOVE IT!!! I will be featuring it tonight at Project Queen's Highlight Party. 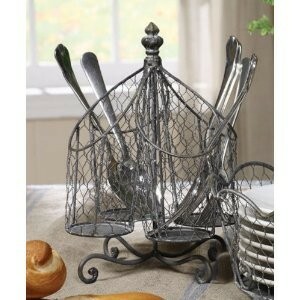 What a really clever idea, I so love all the wire cutlery holders. Your's is so pretty and can't be better than thrifty. But she looks expensive. You really did a great job. My fingers are crossed that you will share this at Sunday's Best going on now. PS - following you on Linky! Wanted to stop by and thank you for joining in on Sunday's Best, it was real sweet of you. I so love your wire cutlery holder, really very creative. Your chicken wire 3 D frame is pretty special too. You're pretty creative. Thanks for sharing your creative inspiration at Sunday's Best! Hope to see you again next week! Very creative and cute! I'm thrifty as well and always trying to come up with a knock off or thrifty version of things. Great job! I'm your newest follower using the new linky following too. Would love to have you come and visit my blog. OMG - I received the Liebster Award!